Yolanda Cardenas reflects on growing up in Back of the Yards, a field trip to the neighborhood firehouse, and a missed opportunity for her father. 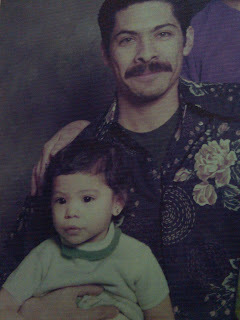 Yolanda Cardenas with her father, Felipe Cardenas in 1976. Proyecto Latina is a big fan of the Chicago based group Alla. And if you are familiar with their music and you ever tune into our Sunday afternoon show you will know that our show intro features a snippet of one of Alla’s songs from their first CD Es Tiempo. 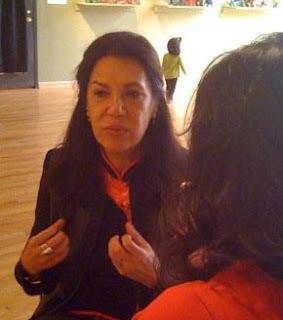 Proyecto Latina’s music director, Yolanda Cardenas sat down with Alla earlier this month to talk about their music and uncovered some interesting stuff about the intensity and drive that moves them. The Mexican-American band and it’s unconventional and sophisticated sound is formed by: Lupe Martinez (vocalist/guitarist) and the Ledezma brothers, Jorge (producer/guitarist) and Angel (drums). Allá’s debut album” Es Tiempo “ was produced by Jorge Ledezma over a four-year period, using no less than 8 studios. Most recently they released Digs, a new mini-album where the band pays tribute to a diverse list of artist and songs that helped bring their unique musical vision into focus. Catch Alla with us this Saturday, May 16th, they will be performing an acoustic set at the National Museum of Mexican Art as part of the Sor Juana festival and the Letras, Palabras y Cantos event. Details below. The multi-talented Cervantes sisters have roots in Back of the Yards and Chicago’s Southside but their music casts a much wider net and draws inspiration from a very diverse mix of music genres. 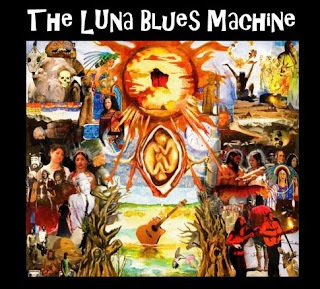 The Luna Blues Machine fuses acoustic hip-hop with soul, folk, latin and any other genre that moves them. Fronted by sisters Belinda and Maritza Cervantes (mandolin and guitar), LBM stands out as one of the most experimental acoustic music acts working in Chicago today. With the accompaniment of bass and drums, their feel-good rhythms, engaging stories, tight harmonies and charismatic hooks will make you want to getcha self a little luna love.